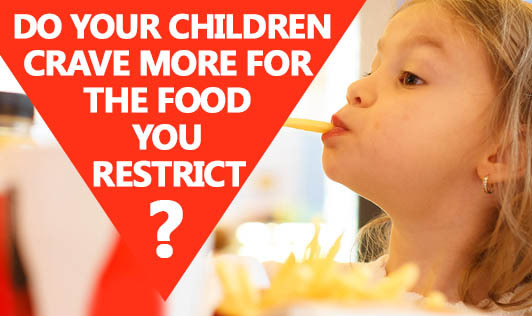 Do your children crave more for the food you restrict? It is generally observed that children love to do what they are asked not to. This includes craving for foods they are restricted. Researchers wanted to prove this attitude of kids and so they conducted an experiment. They took a classroom full of kids of three and four year olds and for a week observed the children's reaction to restricted foods. They found out two foods that were equally indifferent in the kids' preferences. They were mangoes and raisins. In the beginning both were given to the kids to treat on. Slowly mangoes were given to treat on and raisins were held back. This increased the children's liking towards raisins and ultimately there was a stampede to reach the forbidden fruit. So...restriction on foods will have adverse effect on your kids making them more attracted to that. This might even lead to them hiding their snacking habits. Figure out a better approach to deal with your kid's diet.